Civilization VI recently announced its second full expansion, Gathering Storm, which focuses on the environment and diplomacy, and now they’ve revealed a new leader that mixes up the series’ usual rules a bit. 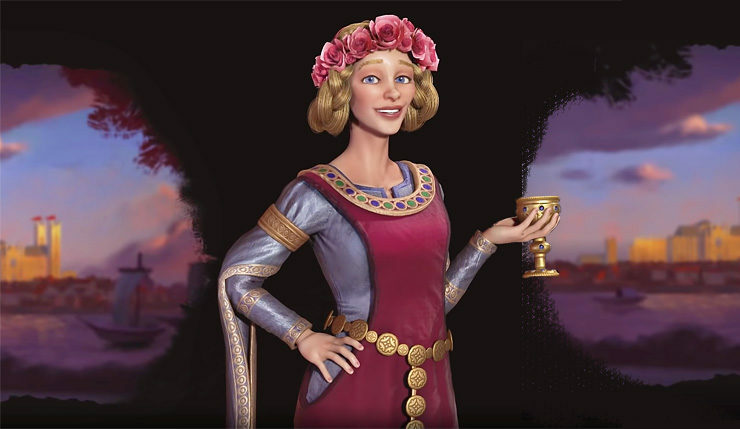 Eleanor of Aquitaine will be able to lead two civs, England and France, a first for the series. Eleanor served as queen consort (wife of a reigning king) for both England and France, was one of the wealthiest women of her time, and was active in military affairs, which included a leadership role in the Second Crusade. Not a bad choice for the first-ever double leader. You can check out a video overview of Eleanor of Aquitaine, below. Would be interesting more multi-civ leaders in the future, although I can’t think of too many non-controversial examples (Napoleon conqueror types are probably out). Firaxis has also announced Hungary, the Maori, Canada, the Inca, Mali, Sweden, Phoenicia, and the Ottomans will be part of the Gathering Storm expansion. Civilization VI: Gathering Storm, will include a total of nine new leaders representing eight civilizations. The $30 expansion comes to PC on February 14. Now that all the Gathering Storm civs and leaders have been announced, what do you think of the lineup? Obviously, I’m getting the expansion because Canada is finally included, but overall it seems like a nice, varied collection.